I know it is a cliché to talk about gratitude during Thanksgiving but I am going to do it anyway. Thanksgiving is a great reminder to take a moment to acknowledge all that we have – all that is well and good. These may be simple every day things that we now take for granted, or have become accustomed to, due to repetition and familiarity (one of my clients once said that a hot shower was something for which she had tremendous gratitude). Or we can practice gratitude for something extraordinary and life changing. The power of focusing on our appreciation for what we already have extends to the structure of our brains and the quality of our moods. In The Happiness Advantage, Shawn Achor emphasizes the importance of a daily practice of gratitude based on the findings of general happiness research. Achor summarizes the research by writing, “… consistently grateful people are more energetic, emotionally intelligent, forgiving, and less likely to be depressed, anxious, or lonely.” Similar to building a muscle or mastering a skill, gratitude needs to be practiced consistently in order to train your brain to be more positive overall. 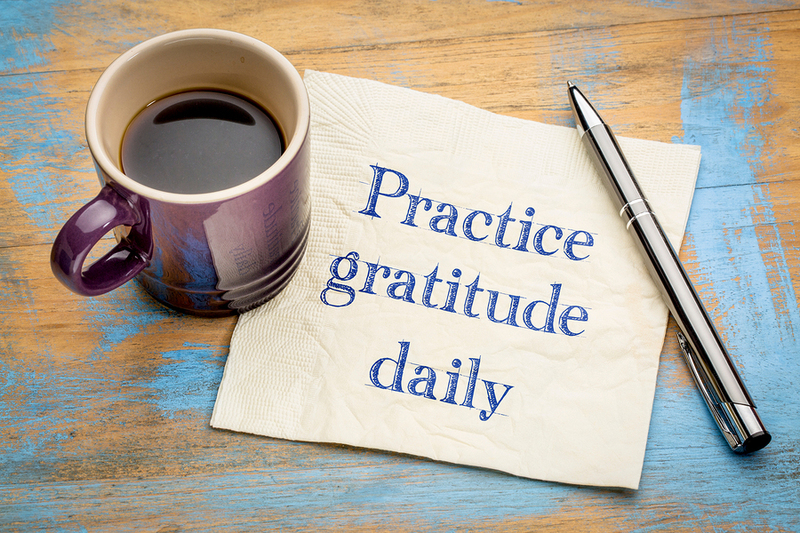 There are several ways to create a gratitude practice of your own: gratitude jars, journals, beads, etc. Most weeks, while I am at yoga, my husband and my daughter smudge the house with sage. As they move from room to room, they express gratitude for what each space represents – food in the kitchen, friends and guests that come to our home through the entryway, etc. Shawn Achor suggests making a daily list of what you enjoy about your job, your career, and your life. Achor explains, “When you write down a list of ‘three good things’ that happen that day, your brain will be forced to scan the last 24 hours for potential positives.” The positives can be related to feelings of success or accomplishment in work or school, loving interactions and connections with family, and/or hope for fulfillment in the future. How ever you choose to design your gratitude practice, make a commitment to see it through for a week and then a month. Notice your mood, thoughts, and behaviors as you implement this practice into your daily life. You might begin to feel a little lighter or more connected to yourself and others.